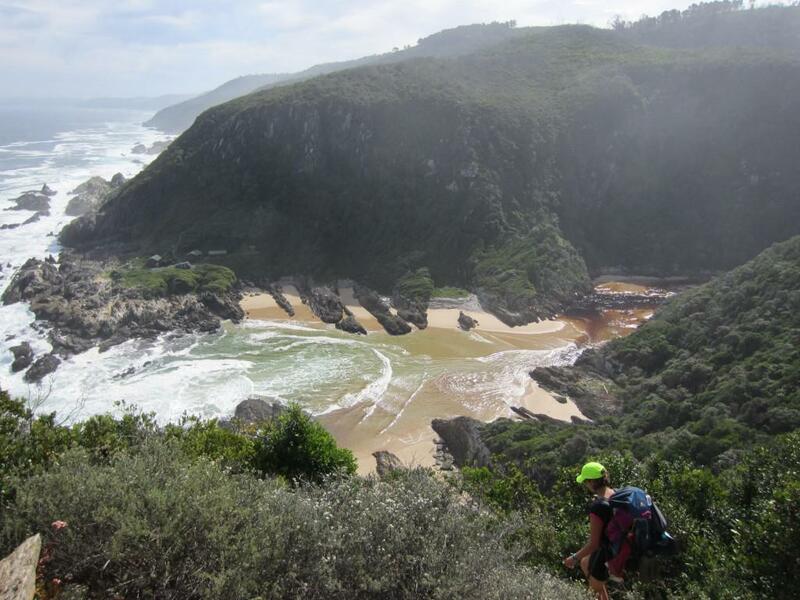 The Otter Trail is most probably the most famous and popular hike in South Africa. I did the hike over Easter Weekend and want to share 10 things that I think you should know if you consider doing this incredible hike. Shortly after the Bloukrans River crossing you have to do some serious rock climbing. 1. You have to be either very young or very fit to do the Otter. If you are over 30 you have to be fit as a fiddle and even then you will find the hike challenging. Only about 20% of the route is level. Most of the trail is up- or downhill and you often have to do some rock climbing. This route is not for people with serious acrophobia. If you want to train for the Otter, go and do some step classes because you will have to climb hundreds and hundreds of steps with a heavy backpack for five days! 2. Be prepared for river crossings. 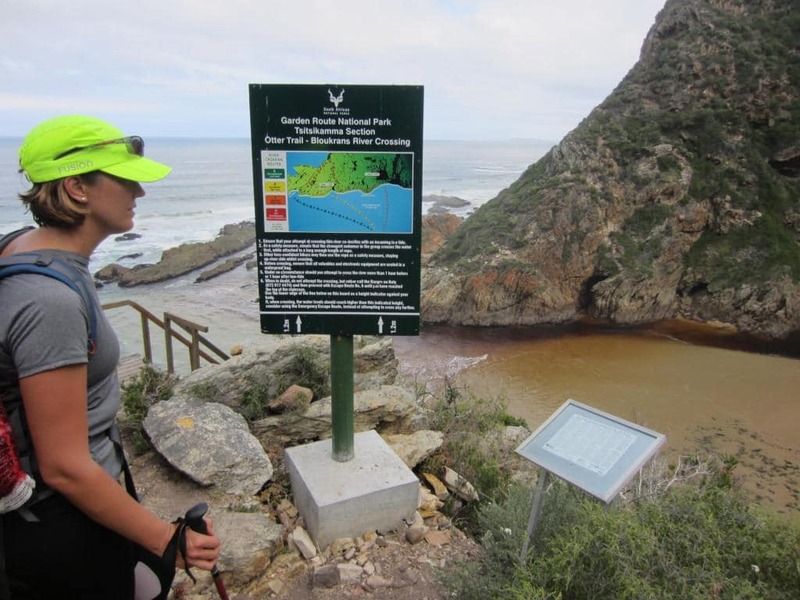 Get the time tables before you start out on the trail and plan the day’s hiking to try and reach the Elandsbos River on the third day and the Bloukrans River on the fourth day at low tide. Line your backpack with a sac liner and pack all your clothing in separate ziplock bags to keep them dry. Take a survival bag along which you can use for floating your backpack across the river if need be. Also take a rope to pull your bag if you need to swim through the river. The Bloukrans River crossing can be dangerous. 3. 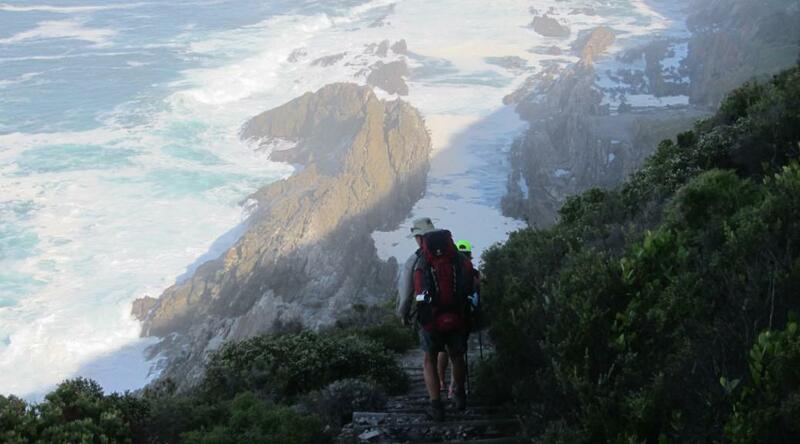 The route is awe-inspiring and the vegetation constantly varies between forest and fynbos. You walk along the coastline all the time. When you are in the forest sections, the sound of the sea is muted by the trees and you only hear the birds’ singing. 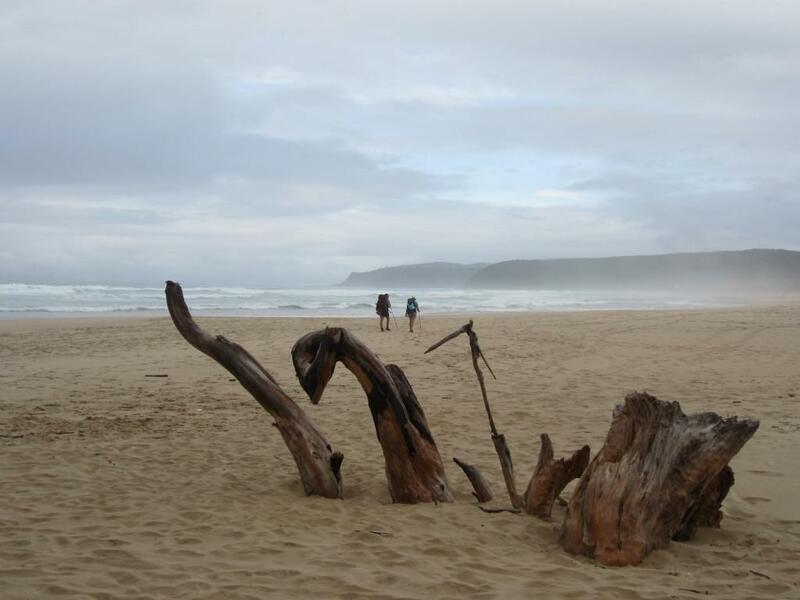 When you walk in the open, the sea can be deafening at times. The views take your breath away. 4. 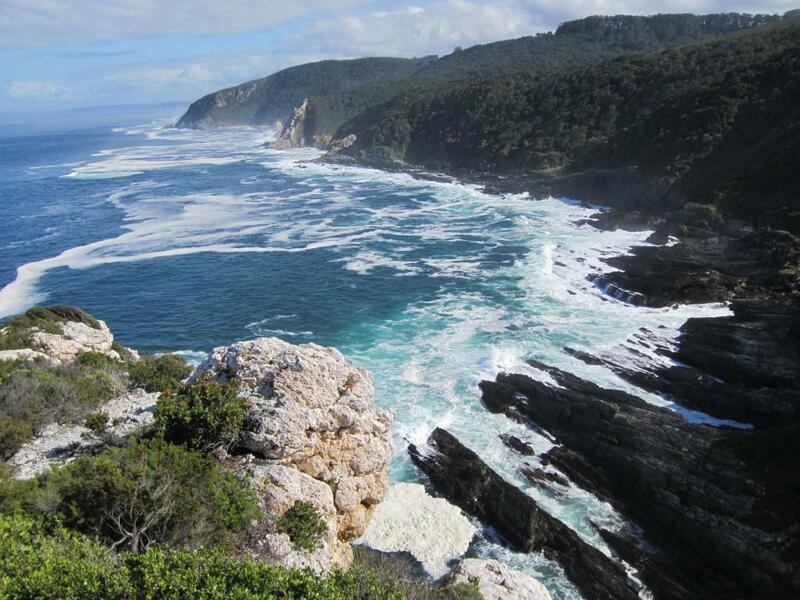 The Otter Trail has loos with the most beautiful sea views ever! At every overnight hut there is a flush toilet with a big window that overlooks the sea. All huts are at sea level. 5. If you won’t survive without a hot shower for four days, the Otter is not for you! There is a cold shower at every night’s camp as well as the option to wash off the day’s sweat in the sea. 6. You can expect to see Rock dassies, Cape genet, Knysna Loerie, velvet monkeys, whales (at certain times of the year) and, if you are really lucky, even leopard! We saw one when we did the hike over Easter Weekend. 7. It is a five day, four night hike over 42 km. 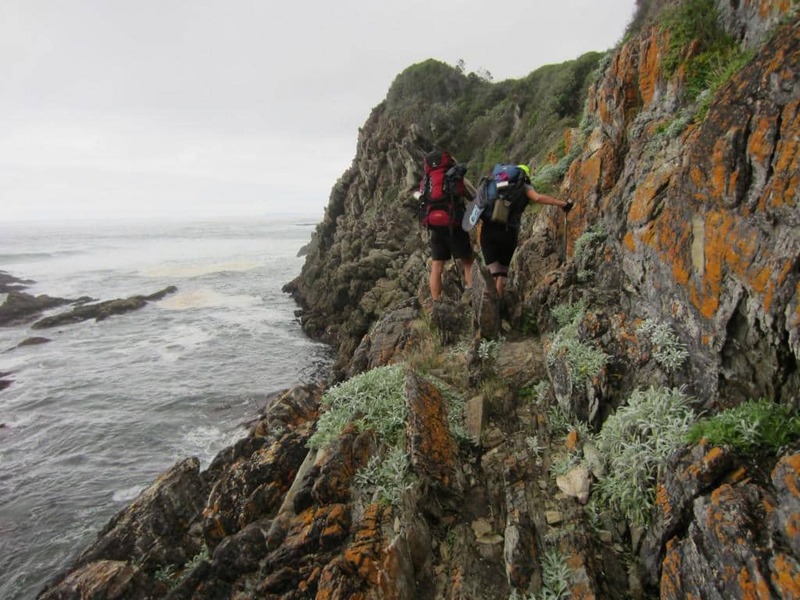 The trail starts at Storms River Mouth and ends at Nature’s Valley. There is a trail run on this route called the Otter African Trail Run. The record time for this race is an unbelievable 4:15. The hike finishes at Nature’s Valley. 8. All huts are situated right on the sea or at a river mouth which means that there is a steep descend to the hut every night and you start with a brisk climb each morning. Huts are basic but comfortable and extremely well kept. There is a braai area at each hut (as well as a covered lapa shared between the two huts) and ample wood is provided to braai or just enjoy a campfire. 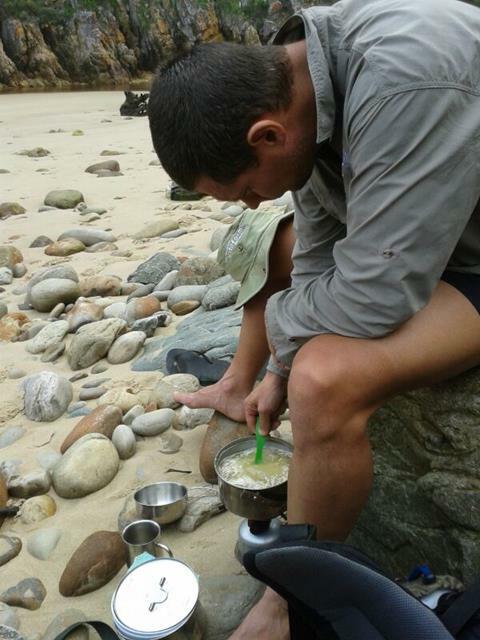 You should, however, still take your own gas stove and pots along for making coffee along the route or preparing soup or pasta when you don’t braai. There is a water tap at each hut and at the lapas. You will need a gas stove for cooking. 9. The weight of your backpack should not be more than a quarter of your body weight. The heavier you carry, the more you WILL suffer. You can spoil yourself a little with nice food (and drinks if you fancy) but you will pay dearly for it. 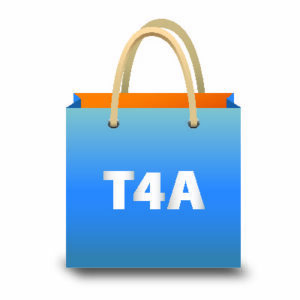 The heavier your bag is, the more difficult it is to balance yourself over rocky terrain. Be wise and pack as light as possible! Limit yourself to lightweight food and just a few treats. Contrary to what one would expect, you do not really get very hungry during the day. Don’t pack the same snacks for all five days. By day three you will be tired of it! Remember, variety is the spice of life and the same goes for meals on a hike. 10. There is no electricity at the overnight huts. Take candles and a LED head light otherwise you will be left in the dark. Susan, I agree that the Otter Trail is definitely a bucket list item! Enjoy your second time. I also did it twice, 23 years apart, and enjoyed the second time just as much as the first time. The Otter Trail needs to be on everyone’s bucket list! Made the mistake to carry a 22kg pack the 1st time, not making that mistake again! Doing the trail a 2nd time in 2016.